Lose That Girl: RATE IT! Quarter "Spies"
Canada's humble "Poppy" quarter, issued as a special remembrance to our soldiers & war dead in 2004, apparently raised espionage fears amongst the Pentagon in the US! 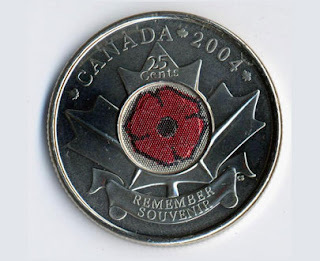 The Americans thought that the poppy quarter issued by the Canadian Mint with its special coating to prevent the red from rubbing off, was actually a radio frequency transmitter. The Toronto Star reports on an investigation by AP brass that focuses on a series of emails that circulated a few years back between Pentagon officials in Washington, DC. They seriously believed our commemorative poppy quarter was the latest thing on the spy scene. Blame Canada - yet again - d'oh! Perhaps the Americans should pay attention to their real enemies instead? Yep, sound like an American thing to me. Remember bush was President then and looking at it I could see why 'they' would think so.